Atop Mount Faber, the second highest hill in Singapore, is a glass-walled dining complex called the Jewel Box. Inside you’ll find three fine-dining restaurants plus Moonstone, a casual al fresco bar serving up Japanese nibbles and stunning views of Sentosa Island. 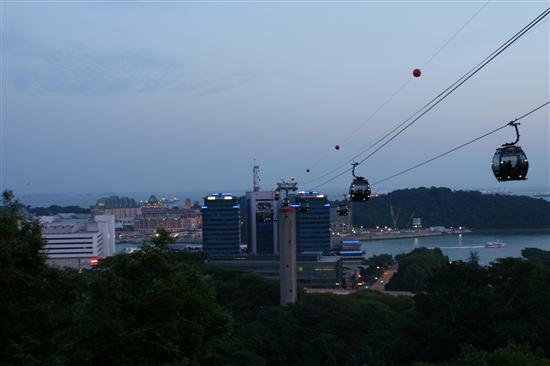 Moonstone is as high above Singapore as the cable car. While The Jewel Box’s three restaurants (Black Opal, Sapphire, and Empress Jade) are quite formal, at Moonstone you’ll feel welcome even if you’re wearing shorts and flip-flops. 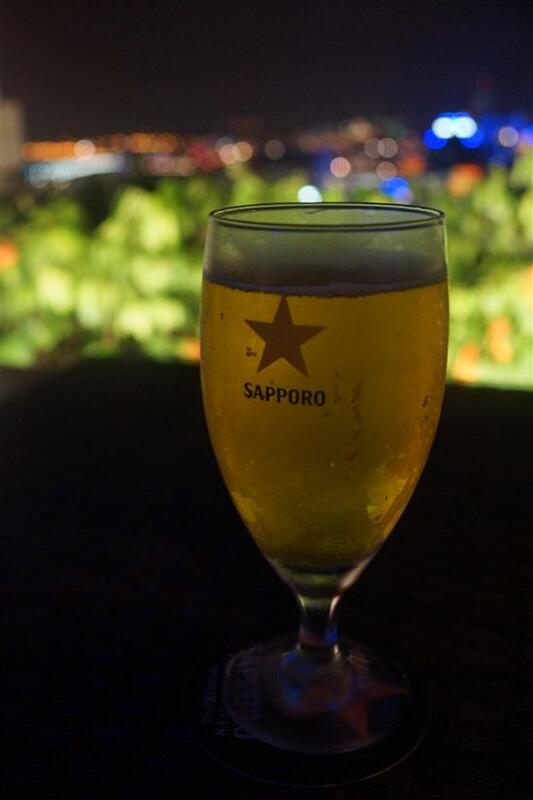 This completely open-air bar is located next to the Mt Faber Cable Car station, and the customers are a mix of tourists who want to enjoy the view a little longer and locals who come for the chilled-out atmosphere and extensive selection of imported Japanese alcohol. 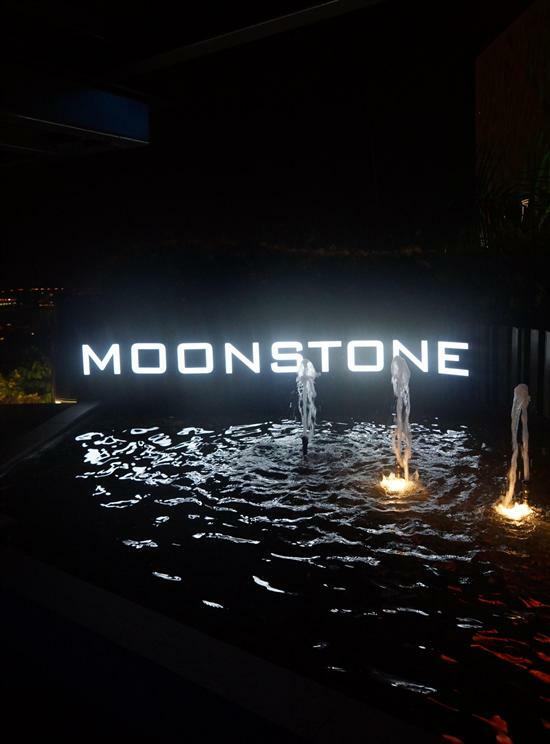 Compared to other view-tiful bars like 1-Altitude where the price of the view is built into the menu, dining and drinking at Moonstone is quite affordable by Singapore standards. Japanese beers like Asahi, Sapporo and Suntory start at S$12 per bottle and house wine is S$15 a glass. Moonstone also has one of the most extensive selections of sake – a mild spirit made from fermented rice – to be found in Singapore, and offers more than 100 varieties priced from S$18 a glass or S$30 for a small bottle. Come for the view, stay for the Japanese beer. 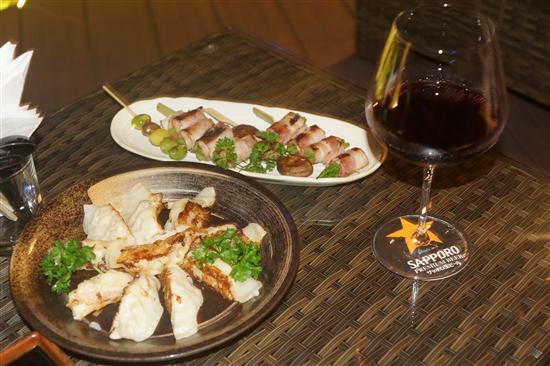 Like the drinks, the food at Moonstone is Japanese and their specialty is yakitori – bite-size pieces of meat or vegetables skewered and grilled. There are options for everyone from vegetarians (shitake mushrooms, baby eggplant) to aspiring Fear Factor contestants (chicken hearts, tongue), but our favourites were the asparagus wrapped with bacon and the smoked salmon. The yakitori is yummy and fairly priced at S$3-5 per skewer, but is more suitable as a snack than a meal. Even the appetisers like edamame (S$4) and gyoza (S$12.80 for 10 pieces) are designed for sharing, so if you want a meal to yourself go with the pork belly noodle soup (S$9). Who says wine doesn’t go with bacon? While we give a thumbs-up to the food and drinks, we’re even bigger fans of Moonstone’s view. With nothing in the way except for the occasional cable car, Moonstone is a great vantage point to see the extent of the Singapore harbour and the huge cargo ships in the distance. After dark, the twinkling lights below coupled with candles on the tables create a very romantic atmosphere. The one downside to Moonstone is that it’s not easily reached by public transportation, though this also means it’s never crowded. The nearest MRT station is Harbourfront and from there Bus #409 runs to the top of Mount Faber, but only on Fridays, Saturdays and public holidays. Alternatively you could take the expensive cable car or hike to the top of Mount Faber, but you’re better off simply taking a taxi.